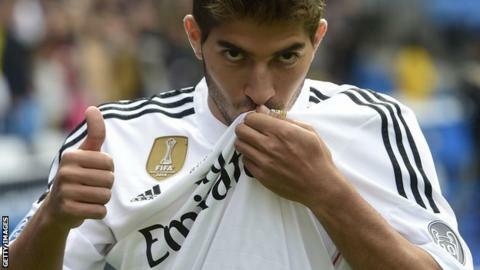 Real Madrid have signed midfielder Lucas Silva from Brazilian club Cruzeiro on a long-term contract for a reported fee of £9.7m. The 21-year-old, who passed a medical on Monday, has signed a contract keeping him with the European champions until 30 June, 2020. Silva has represented Brazil at under-21 level and has helped his club side win the league in 2013 and 2014. "This is a dream come true," said Silva. "I am delighted to be here." He added: I thank God, the Cruzeiro and Real Madrid presidents and everyone who helped make this happen. "I am really happy and motivated. I've come to Real Madrid to learn and above all else to help. "I feel good and am ready to honour this shirt, which belongs to the best club in the world. "I've liked Real Madrid every since I was a child, I'm really happy to be in the city and I'm certain that I will live very well here." Real bought 16-year-old midfielder Martin Odegaard earlier this week. That transfer cost the club £2.3m with Odegaard, who has already won three caps for Norway, signing from Norwegian side Stromsgodset. Silva was presented to the club's fans at the Santiago Bernabeu stadium on Monday. European champions Real are currently one point clear at the top of La Liga.